The true Fall Classic is only two days away. 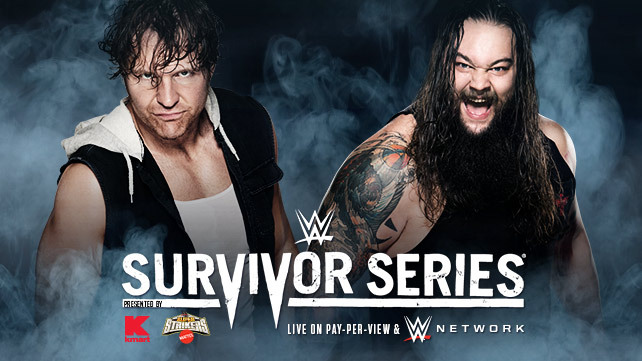 WWE's Survivor Series, the second longest-running pay-per-view in the company's history (28 years), is set to take place Sunday at 8:00 P.M. exclusively on the WWE Network. New subscribers to the network receive this pay-per-view for free, the first one in WWE history and there is no better main event when Team Cena will face Team Authority, where if Team Cena loses, they are all fired. However, if Team Authority falls to the leader of the Cenation, Triple H and Stephanie McMahon, along with the rest of The Authority, will no longer be in power. It is truly a battle for power and a shift in the WWE. All of my predictions are based off matches posted on WWE.com and in that order. In a match-up between four of the most energetic and unique tag teams in recent WWE history is bound to create some memorable moments and spots. Whether they are classic or cringe worthy is another discussion. Getting back to the match-up, each team has squared off against one another in the past several weeks on RAW and SmackDown, with appearances on Main Event as well. Each team or member of each team has picked up victories against their opponents, so it really is a roll of a dice when it comes to their chances. I mean, there's a 25% chance of picking correctly; tough call. Personally speaking, I love the brother duo of Gold and Stardust with their out of this world personas and the Usos are the most entertaining team on the roster with their high-flying spots and infections charisma. Los Matadores are the clear underdog in this contest, therefore, I'll stray away from Fernando and Diego, along with El Torito. This leaves the comical duo of the Miz and Damien Mizdow. The two have been on a creative roll for a while now and it is inevitable that sooner rather than later, Mizdow is bound to step out of the stunt double role and into his own respective A-list position. I see a mishap during the match creating the spark for that rivalry and therefore, by deduction, leave it down to the Usos and the defending champions. Flipping a coin, I'm seeing the cosmic keys staying right where they are. Winners: Gold and Stardust retain the Tag Team Championships. Team Natalya, consisting of Emma, Naomi, and Alicia Fox will square off against Team Paige, featuring Cameron, Summer Rae, and Layla; essentially, this is the Total Divas match, minus the Bellas. The most televised Divas of this contest have been Paige and Alicia Fox, with Natalya, Naomi, and Emma facing off against Cameron Summer Rae, and Layla at a host of house shows. It'll be difficult to predict who gets eliminated first from each team, however, it is pretty safe to say that Paige and either Fox and Natalya will be the final two participants. Personally, I have always been a fan of the 21-year old Brit Paige and believe that her villainous quartet will come away with the victory in St. Louis as one of two matches on the card to feature the Divas. This is a rivalry that has been brewing for almost a year now and can be traced back to their Shield vs. Wyatt Family days. Ambrose and Wyatt were the respective leaders of their groups, despite Seth Rollins calling himself "The Architect" of The Shield. Needless to say, this is a battle of who can out-crazy who. Ambrose, the battle-tested lunatic fringe who made his living fighting on the streets and up the ladder in each of his respective independent companies is set to take on the disillusioned Eater of Worlds, Bray Wyatt. Wyatt returned at Hell In A Cell one month ago and cost Ambrose in a Match of the Year candidate against bitter rival Seth Rollins. Over the span of a month, Wyatt has taken shots at Ambrose's personal life, bringing up the strained, almost non-existent relationship between Ambrose and his father and getting under the Unstable one's skin. Ambrose has retaliated with more in-your-face insults and providing Wyatt with instructions on how to build his own "survival kit." Personally, I am as big a Dean Ambrose fan as there is and I believe that his promos and interactions have completely saved this program that, on any other pay-per-view, could be a main event, rather, it is a mid-card battle buried underneath the Team Cena and Team Authority drama. Bray Wyatt is completely alone, physically at least, as he takes on Ambrose and I believe that as valiantly as Ambrose will fight, Wyatt will come away with the victory. Where they go afterward, who knows, but I'd be willing to bet that this could be match of the night. AJ Lee has moved past Paige and Alicia Fox and now faces one of her toughest challenges in recent memory in a newly energized and more vicious Nikki Bella. Bella, who defeated her twin sister Brie at Hell in a Cell in a "Loser Becomes Winner's Personal Assistant for a Month" match, has been proving herself in the ring as a solid competitor with an extensive repertoire of moves, including her Rack Attack finisher. I expect these two to have a quality match-up for a title that needs to have some life revived back into it. It is sad to say, but very few people in the WWE Universe care about the Divas Division like they did during the Attitude Era. The match will have chants of "CM Punk" and whatever other name pops up in the crowd during their time, however, these two had a chemistry in their Triple Threat match with Paige at Night of Champions. Personally, AJ Lee is clearly the best female wrestler in the company, at least on the main roster (*cough* Charlotte *cough), but I feel that Brie Bella, who is almost finished with her punishment will cost AJ Lee the title and we see a new Divas champion. It all comes down to this. Team Authority has been in charge for far too long, or so John Cena believes. Over the last month, Cena has attempted to put together a five-man team to take down Triple H and company, however, The Authority has been ahead of the curve, taking out opponents left and right, starting with Cena's first teammate, former Intercontinental Champion Dolph Ziggler. Following a vicious backstabbing by Mark Henry, Big Show followed Ziggler. Sheamus was defeated on a WWE Network exclusive for the United States Championship by the Bulgarian Brute, Rusev and has wanted revenge ever since the Authority interfered in his rematch. Going into Raw, that was all Cena had. Over a series of events, Sheamus was attacked and injured, allowing former Wyatt Family member Erick Rowan to join Team Cena. His running mate, Luke Harper, would find himself as the Authority's "team playa." The most sought after free agent in the battle for WWE supremacy was "The Big Guy" Ryback. After weeks of back-and-forth campaigning, Ryback came to the aid of a desperate John Cena and the teams were set. Personally, I will be rooting for Team Authority. Face it; they have given the fans what they want. Did Daniel Bryan not make it to Wrestlemania 30 and win the WWE World Heavyweight Championship? He did, after proving himself. Did the WWE Universe want John Cena as WWE Champion for another long run? No, Brock Lesnar came and ruined that party. Who made all of the Dean Ambrose vs. Seth Rollins match-ups? The Authority. Unless you're a child or a parent of said child, The Authority was not right. However, if you're almost everything but the aforementioned, you really can't complain with how the Authority ran things. Ultimately, and sadly, I have to choose Team Cena. Like it is in most sports, it's easier to get rid of management than it is to get rid of the team/roster. The fifteen-time former Champion will pick up one of the biggest victories of his career as he'll pin Seth Rollins for the final elimination at the 2014 Survivor Series. Rumor has it that Sting will appear as soon as Sunday night. Whether he debuts is anybody's best guess, but I'm very skeptical of that. Personally, I feel that the only match fans would have cared to have seen was Undertaker vs. Sting at Wrestlemania 31, but there is always the feud that could be created between he and Cena. Again, we'll see this Sunday, but I will not be holding my breath. Look out for Cesaro to make an impact in the main event. Rather he turn his back on the Authority, cost someone on Team Cena or Team Authority to be eliminated, I believe the Swiss Superman will have a role. Dean Ambrose and Bray Wyatt will steal the show. The more I think about it, these two are too good as complete packages to have a dull match. Fingers crossed that Randy Orton makes an appearance during the main event. I know he is off filming a movie, wait, sorry, "out indefinitely with an injury", but it would be fantastic to see The Viper return. Although there are only a handful of matches on the card and the whole show is focused on the main event, I feel that the pay-per-view, if everyone delivers, could be one of the better top-to-bottom pay-per-view cards WWE has produced all year.